The most recent trailer for The Hobbit was nothing short of breathtaking, and a new poster showed up shortly thereafter with Martin Freeman in an image that calls back to the original posters for Lord of the Rings with Elijah Wood in the spotlight. Now it's the dwarves turn to get the spotlight in a new poster. 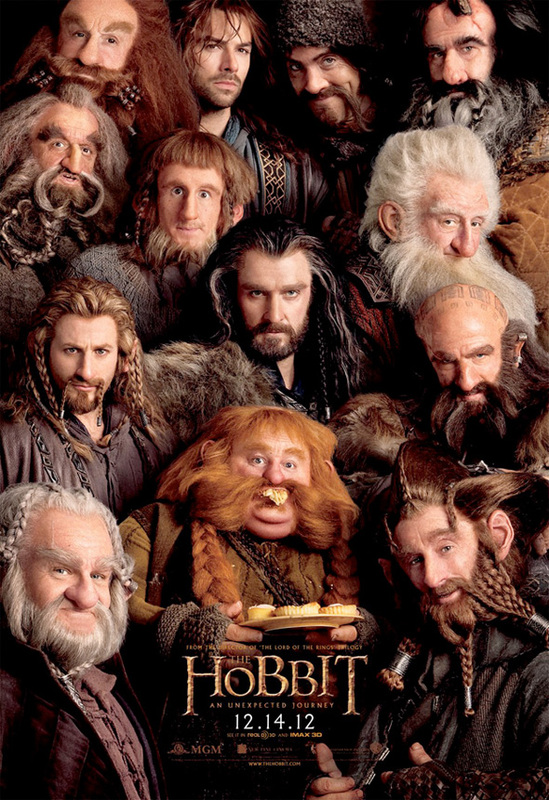 There's Nori (Jed Brown), Ori (Adam Brown), Dori (Mark Hadlow), Fili (Dean O'Gorman), Kili (Aidan Turner), Oin (John Callen), Gloin (Peter Hambleton), Bombur (Stephen Hunter), Bofur (James Nesbitt), Bifur (William Kircher, Balin (Ken Scott), Dwalin (Graham McTavish) and Thorin (Richard Armitage). i liked the one with the beard. I'm sorry, but as someone who actually enjoyed the LOTR trilogy, The Hobbit has done nothing to boost my interest. The poster, like the trailers, is problematic to me because it gives the film a kind of slapstick feel. Hopefully the first reviews will turn things around, but as of now, I would say the interest level is pretty much nonexistent. I'm obviously speaking for myself. "Boost my interest" would seem to indicate who I'm talking about. But nice attempt at trying to be clever. we heard u the first time. I was obviously talking about myself (". . ..The Hobbit has done nothing to boost MY interest"), but nice attempt at trying to be clever. where can i get this? it's awesome! I don't care anything about it, either. I liked the trilogy well enough but I don't fall into the fan catagory. Well looks like this movie is geared towards kids too. Something kind of like Harry Potter. You can see it in the trailers as well. Most of the marketing hasn't been too dramatic, its been very fun and bubbly. Im guessing cause its a big franchise now, and because of how cute the dwarves are supposed to be, its trying to gear in the little ones as well. If this isn't rated at least PG-13 then you can tell its all about the $$$$$$$$$$$$$$ my two cents on why The Hobbit doesn't look appealing as The LOTRs Trilogy in terms of marketing. I think it makes sense that the first film will be more "fun and bubbly" The last of the third will probably be on par with the fellowship drama wise or maybe even more to make the transition to LOTR. "It's time to play the music, It's time to light the lights...."
At first glance I thought that was the snow white and 7 dwarves poster. With that said I'm not crazy for the poster it seems too goofy for a serious and epic franchise I want to see Bilbo standing high in the mountains with a raised sword at hand. It may sound typical but I favor that then this thing. I'm sure others enjoy the poster but that was just my opinion I'm still hopeful it'll be a great film. The last trailer and this poster have actually done a good job reminding me that "The Hobbit" is waaaay more lighthearted and silly than LotR ever was. I remember Jackson talking about how different the tone would be way back when Del Toro was in line to direct. I'm sure all the material they've pulled from the mythology will be in line with LotR "epic"ness, but I like that they're embracing the levity of The Hobbit book, and not going full-on gloom-and-doom.